Edamame! Do you love it? Is it eh? For vegans and vegetarians, edamame and it’s many products (tofu anyone?) can be game changers when it comes to getting enough non-animal protein. Even for meat lovers, this humble bean has a lot to offer. Flavor, texture, and versatility are just some of the good stuff edamame brings to the table. What are edamame though? They are immature soybeans, or those that haven’t ripened and hardened. Fresh soy beans basically. You can get them in the pod, or at your local Japanese restaurant, or most conveniently- shelled and frozen. Buy them for cheap, defrost in a quick microwave minute, and have instant protein! Soy is a complete, plant protein. This means it contains all the essential amino acids we need to get from our food. Most other plant proteins are missing some of the essential amino acids, so they have to be paired at meals, or thoughtfully chosen throughout the day so you get the protein you need. Not soy though, it’s the complete package! You definitely don’t have to be vegetarian or vegan to enjoy these guys. Like I said, they are super versatile, with a light, savory flavor that matches well with other flavors the beans easily take on when seasoning them. I found out by accident one salad that edamame goes awesome with sharp, aged cheeses like parmesan.They both have complimenting nutty, savory flavors that play perfectly together. 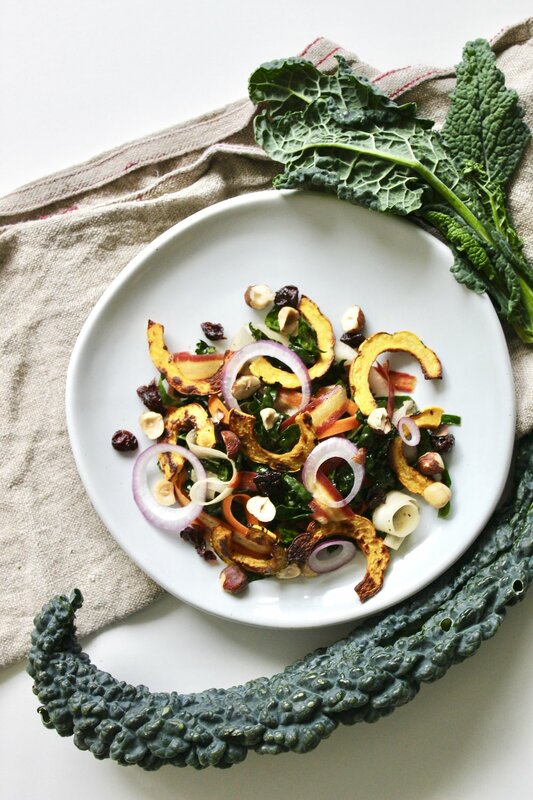 This salad continues on that bright, funky, savory, and salty theme with a flavor bomb miso-tahini dressing that is wonderfully creamy and deliciously reminiscent of caesar (but vegan!). This, plus wholesome, full bodied massaged kale and the edamame and a little parmesan on top makes for one super umami dish. Umami, if you are out of the loop, is the 5th taste we can sense (along with sweet, sour, bitter, and salty). It is present in composed dishes with developed flavor from techniques like caramelization, as well as found naturally in foods like beef, tomatoes, mushrooms, and cheese. Most simply put, umami = savory. That almost indescribable rich, kind of meatiness that makes us keep coming back for more, that’s umami. And this salad’s got a whole lot of that. Enjoy! 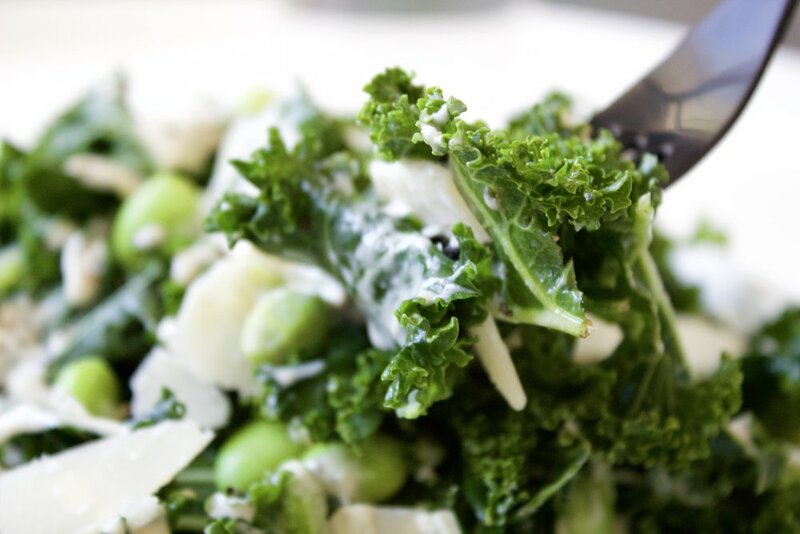 In a small bowl combine the miso, lemon juice, tahini, water, garlic and salt and pepper to taste to create a creamy dressing. Combine the kale with the 1 tsp. lemon juice, ½ tsp. olive oil, and a little salt and pepper. Rub well with your hands for a minute to tenderize and season the kale. 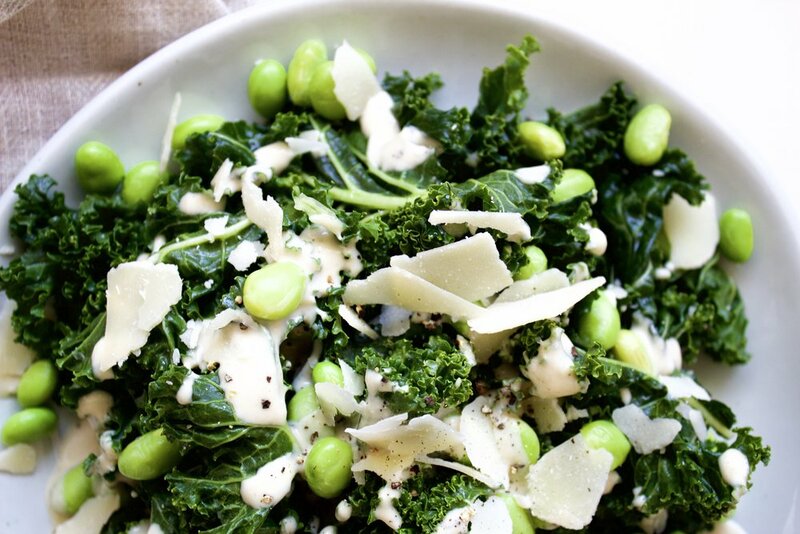 Toss the edamame, kale and dressing together (or drizzle dressing on top if you prefer) and top with shaved parmesan and more fresh black pepper if you like, to serve.